Several weeks ago we had the opportunity to send our daughter off for her first semester of college. As any parent knows, this is both an exciting adventure and a scary one – it’s a very strange feeling to realize your little girl is now a full-fledged adult with all the thrills and responsibilities that entails. If you haven’t been on a college campus in awhile, let me tell you things have changed. 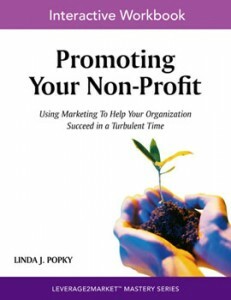 On the heels of the great response from our seminar earlier this year, we’ve collected many of the tips and techniques we shared with non-profit organizations into an information-packed, easy-to-use workbook called Promoting Your Non-Profit. This easy-to-use, information-packed workbook will get non-profits and membership organizations on the right track to creating effective marketing and promotional programs. No knowledge of marketing is required. To thank you for your support, until November 15, 2009, this workbook is available at a special reduced price to the Leverage2Market community. Choose either the printed workbook or eBook. Use the coupon code “L2M Associates” to get the special reduced pricing. Now more than ever, it’s important to be recognized as a leader in your field. Customers, prospects, and employees need reassurance that they are associated with strong organizations that will continue to thrive in tough economic times and beyond. They want to know that the companies they partner with are thinking ahead and will remain so moving forward. Learn why it’s so important to use thought leadership to grow and develop a strong brand. Understand how you can use simple, cost-effective marketing techniques, including social media, to build and differentiate your business, especially in tough economic time. Our research project to understand how effective organizations build competency in their marketing teams launches in October. The study will include 1:1 interviews with senior marketing executives at organizations with established marketing organizations of at least 50 people, as well as a short online survey aimed at marketing executives in small and medium size businesses. As part of our passion to build strong marketing professionals, Linda Popky has joined West Virginia University’s (WVU) Master’s in Integrated Marketing Communications (IMC) program as an adjunct instructor. She’ll be teaching an online course in Brand Equity Management starting in October 2009. WVU’s IMC Master’s program is offered exclusively online with no classroom attendance is required, enabling students to earn their degrees from anywhere in the world. Upcoming guests include Norma Watenpaugh on the importance of strategic alliances, Karen Galatis on integrating technology into go to market programs, and Lynn Hunsaker on new rules for innovating the customer experience. We are pleased to announce that in January 2010, Linda will be launching and leading a new Marketing Strategy roundtable breakfast meeting series for the Northern California Business Marketing Association. Modeled on BMA’s successful series of roundtables on product marketing, branding, and other marketing areas, the new series will feature dynamic speakers focused on marketing strategy topics of interest to Silicon Valley marketing professionals. Meetings include breakfast and will be held the last Wednesday of each month at 8:30 am at Scott’s Seafood Restaurant in Palo Alto, starting Wed, Jan 28th, 2010. Leverage2Market’s Linda Popky has joined the Law Biz Forum, hosted by renowned law business practice expert Ed Poll, as a marketing expert. In July, Linda presented Weathering the Storm: Learnings from the Recent Women in Consulting (WIC) Compensation Survey at a Women in Consulting Webinar. On Sunday, November 1st, Linda will again be participating in the Crestmont Conservatory Annual Pianothon. She’ll be playing selections from Chopin, as well as Mozart and Bach piano concertos, in this fundraising event. Tax-deductible tickets are only $20 and good for the entire day. More information. We’ve expanded our pro bono work this year to support both Astia, the business accelerator for high-growth women-led businesses, and Clean Tech Open, the world’s leading clean tech businesses competition. These worthwhile non-profit groups help entrepreneurs hone their business plans and access potential funding sources. Linda is pleased to be asked to judge the 2010 New Mexico Women’s Press Communications Competition. More information. We are in the process of booking our Winter ’10 speaking schedule. If your business or association could use a dynamic, thought-provoking presentation or workshop on marketing or business strategy, please contact us.